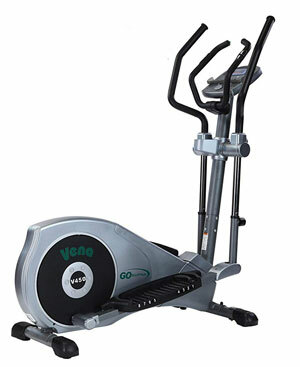 The Go Elliptical V-450 is one of the “Vena” series cross trainers along with the V-200 and V950PU. 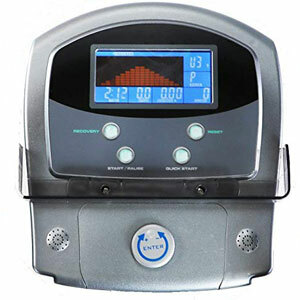 It’s a machine designed for home use, featuring an eddy current resistance system with digital adjustment. Compared to other similar elliptical trainers in this price range, the V-450 has a few extra features, such as pedal adjustment and arm adjustment. The Go Elliptical Vena V-450 combines steel and ABS parts in its construction. Most of its structural frame is made of steel tubing while the covers of the drive and resistance elements are made of ABS. The pedals and several other small covers are also made of heavy-duty ABS material. The main steel tubes of the unit’s frame are coated with a corrosion-resistant paint, with the exception of the adjustable parts of the moving arms which feature a chrome plating. The color of the paint finish used for the base frame and the front mast is dark gray, this being the only color available for this Vena model. The GoElliptical V-450 is not exactly one of the largest elliptical trainers. Its footprint is only 50″L x 26″W (127 x 66 cm). However, it is recommended to leave at least two feet of clearance on each side and at the rear for safe operation. Also, in case you’re wondering, the frame of the unit does not fold. But its front base is equipped with a set of transport wheels which ease its relocation once you have finished your workout. The fully assembled machine is not extremely heavy but does weigh approx. 126 lbs (57 kg). This being said, it is recommended that its assembly is carried out by two persons. On the other hand, this weight plays an important role within the unit’s overall stability. Plus, its stability is enhanced by the levelers placed on both its base bars. 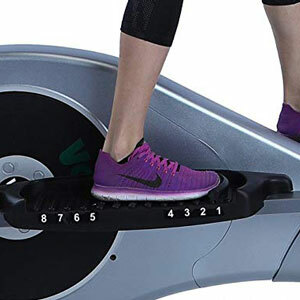 The Go Elliptical V-450 is equipped with two extra large pedals. They feature a ribbed, non-slip surface. They are attached to two durable steel bars; therefore, the unit can hold users up to 300 lbs (136 kg) with no problem. The machine’s pedals do not have any extra cushioning or articulation like the pedals of the ProForm Endurance 920E, for example. However, they are adjustable. Their surface features a foot-stopper which can be placed in 8 different positions. 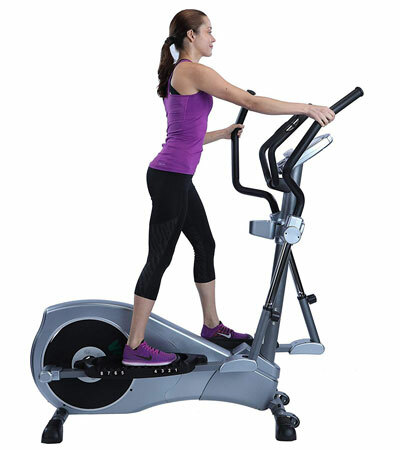 Last but not least, this elliptical trainer makes available two sets of handlebars, one fixed, one mobile. Both sets have a multi-grip design, with a long, rubberized surface. The fixed handlebars integrate metallic pulse sensors; they also have resistance adjustment buttons on their ends. Conversely, the moving arms are adjustable; they have three adjustment positions and are easily locked/unlocked via their front knobs. 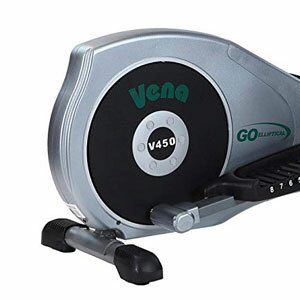 The Vena V-450 GoElliptical is a rear-drive cross trainer. Therefore, its elliptical path is slightly inclined forward. In other words, a ride on it feels like you’re descending on a very soft ramp. This can be seen as a plus because it puts more focus on your glutes. The machine offers a stride of 17″ (43 cm). Therefore, it should be able to accommodate comfortably users up to 6’2″ (188 cm), promoting a satisfying range of motion. But nonetheless, even if you’re taller, you should still be able to exercise on it and benefit from a consistent cardio workout, as long as you don’t exceed the specified 300 lbs (136 kg) weight capacity. At their lowest position, the pedals are at approx. 6″ (15 cm) above floor level. Conversely, their highest point is at approx. 16″ (40 cm) above floor level. This being said, the pedal step-up height is somewhere in between, at approx. 10″ (25 cm). Therefore, GoElliptical recommends using the machine in a room with a ceiling that is at least 20″ (51 cm) higher than your own height. 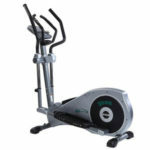 The GoElliptical V-450 cross trainer integrates an eddy current resistance system. In other words, it has a motorized magnetic internal brake. The resistance adjustment can only be done from the console (and from the buttons on the fixed handlebars), while the machine needs to be connected to a power source. Once you select your desired tension level from the console, the internal servo motor will change the magnetic pull on the internal flywheel which results in more or less pedaling difficulty. The machine makes available 24 distinct tension levels. 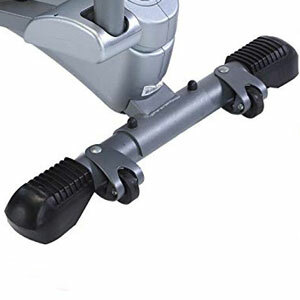 The first several levels deliver a light pedal tension, great for users who need recovery training, or for anyone who wants to perform a light workout. Conversely, the 22-24 tension levels offer the possibility to put more focus on your leg muscles and achieve a high cardiovascular rate in a very short time. The cross trainer is equipped with a 15.4 lbs (7 kg) magnetic flywheel. This element is also perimeter-weighted, designed to deliver a consistent momentum and a smooth motion. Like most other fitness machines with an internal magnetic brake, the GoElliptical Vena V-450 cross trainer features a belt drivetrain. It uses a heavy-duty belt which provides an almost completely silent pedaling motion, with considerably less vibration than a chain drive. It also eliminates the hassle of periodic lubrication. The machine’s drivetrain allows reverse pedaling. Therefore, you can backpedal if you want, in order to alternate different muscle groups. The Go Elliptical V-450 includes a mid-range console which has a multi-window LCD display with LED backlight for superior readability. It tracks the most important workout metrics, including time, distance, speed, calories, and pulse. It is not telemetric, though. This means it can only track your pulse through the integrated sensors. It is not compatible with wireless HR straps. The console unit does not have Bluetooth connectivity, nor it is compatible with any online apps. However, it has 24 preset programs to keep you motivated. Each program has its own specific. Some are designed to help you burn more calories, others are interval-based, and others focus on your heart rate. Plus, the Random program provides a different profile whenever is launched, this way offering something new for each one of your workouts. There is also a Recovery function. This requires you to use the pulse sensors at the end of your workout. Therefore, the console will measure the amount of time required by your heart to return to normal, and based on this measurement, it will provide you with a fitness rating between F1 (Excellent) and F6 (Poor). The console makes available four user profiles. Each user can save their own personal data such as body weight, height, gender and age. Therefore, the unit will be able to provide a more accurate calorie value and recovery value. In terms of amenities, the console unit offers a tablet holder and a sound system. The tablet holder is placed under the unit’s display; it’s fairly large and can accommodate most tablets and smartphones. The sound system consists of two small speakers placed on the bottom corners of the unit. Therefore, you can connect your MP3 player, smartphone or tablet to the console and play your music through it. The base section of the machine with all the resistance and drive elements comes fully assembled. All you need to do is attach the base bars, the console mast, the pedal bars, the pedals, the handlebars, and the console. This shouldn’t take more than one hour. The manual provides clear schematics and step-by-step assembly instructions. Also, a basic toolkit is included with the machine. Internal maintenance is not necessary for this elliptical cross trainer (at least not for a long period of time). So, in terms of maintenance, you only have to check for loose bolts and parts, and lubricate the joints of the machine in case they begin to squeak. EKG pulse sensors built-in the fixed handlebars. The GoElliptical Vena V-450 is a mid-range cross trainer offering 24 levels of eddy current resistance, 24 preset workout programs, adjustable pedals and moving arms, and a pretty sturdy overall construction. It’s an excellent machine for light to medium intensity cardio training, muscle toning, stamina development, and weight loss. And finally, it offers fairly decent quality for the price.